The only useful international service into the Pula airport is Ryanair's flight from London Stansted, three times weekly starting at $55 including taxes (that's not a typo; that's a low-cost airline: www.ryanair.com). The airport is also served by Croatia Airlines (croatiaairlines.com) and Air France (airfrance.com), but flights from North America require at least two or three transfers. It's far better to drive in from a major city outside of Istria. The closest big-city gateway is Trieste, Italy, just a few miles across the border (some consider its southern suburbs part of Istria). Ljubljana, Slovenia, is less than two hours away by car, and Venice, Italy, and Zagreb, Croatia, are both within a four-hour drive. You can also grab a boat from Italy. Hydrofoils from Venice (tel. 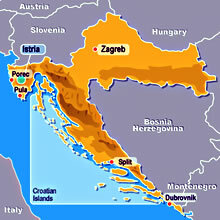 +39-041-242-4000 in Italy, +385-(0)52-422-896 in Croatia, venezialines.com) head to Poreč (2 hr. 30 min.) with sailings once or twice a week in April and October, increasing to almost daily—twice a day on weekends—in July and August. The service also connects Venice with Piran, Rovinj, and Pula, but with less frequency (it varies, but at least weekly) and slightly shortened sailing seasons. From late April to late September there's also a coastal ferry from Trieste (tel. +39-0923-873-813, www.triestelines.it), twice daily except Sundays, with stops in Portorož/Piran (45 min. ), Poreč (2 hr. 15 min. ), and Rovinj (3 hr. 15 min.). Buses connect most towns, as do some ferries, but the peninsula is best explored by car. Istria is not big—you could leave Trieste after breakfast, drive all the way to Pula, and be back in Italy in time for lunch—but it's packed with riches that can easily eat up a week. Invest in a good, recently published map as soon as you arrive. Many maps available outside Istria don't yet show all sections of the Y-shaped Ipsilon highway, completed in 2006. Besides, some of the best days in Istria are those spent exploring back roads and tiny towns, so you'll want a detailed map.